There’s more to installing a bathroom sink than simply hooking it up to the DWV and water-supply system. In many cases, a fair amount of cabinetry needs to be installed (and perhaps even built) first, which also means that a countertop will be needed as well. 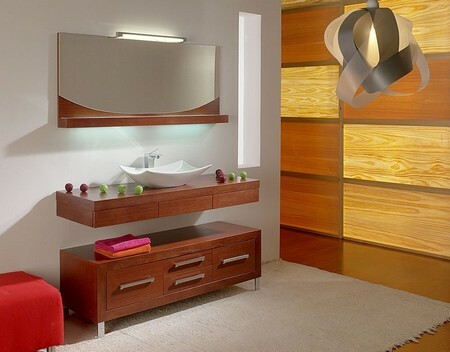 In other cases, the sink will be a self-contained freestanding or wall-mounted unit, but even then it will probably require some brackets to hold it in place. Compared to installing a run of kitchen cabinets, installing a few bathroom cabinets is a breeze. Like with any cabinet installation, you’ll first need to check the condition of the floor and walls to see if they’re plumb, level, square, and straight, and verify the exact location of the cabinetry. While I usually draw a kitchen-cabinet layout on the floor and wall, that isn’t usually necessary with bathroom cabinets. If the floor is out of level, then the cabinetry will have to be either shimmed to level or scribed to the floor. While shimming is faster and easier, especially for long runs of cabinets, it leaves a gap at the base that needs to be covered with some type of molding. 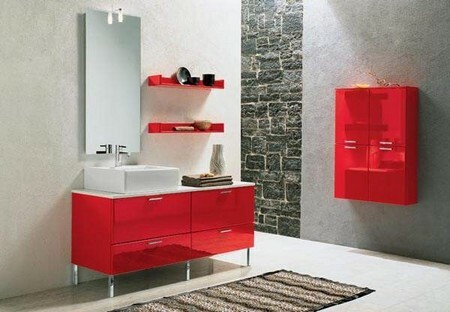 For the few cabinets that usually are installed in the bathroom, scribing leaves a cleaner look. To scribe, I’ll run a width of masking tape around the perimeter of the cabinet base, temporarily shim the cabinet (or cabinets) to level, set my scriber to the distance that the cabinetry extends above a reference level line on the back wall, and scribe the cabinetry at floor level. Don’t be tempted to try to pull a cabinet snug to an out-of-plumb or crooked back wall; it will just rack the cabinet, making the doors appear to be warped. Instead, run masking tape along the back edge of the cabinet and scribe to that wall too. Some cabinets also need to be scribed to fit a sidewall, either on the face frame itself or with the use of a filler strip. There are a number of ways to cut to scribe lines, but I’ve had good success using a belt sander fitted with a coarse-grit belt. If there are multiple cabinets, they need to be attached together; usually I do this first before attaching them to the wall. I usually remove the hinges and drill countersunk holes through the stiles (in face-frame cabinetry) at hinge locations so that the screws will be concealed. Don’t use drywall screws; they’ll snap off. No. 8 wood screws are stronger and allow adjacent cabinet stiles to be pulled tightly together. Once the cabinetry has been scribed and fitted together, it can be attached to the wall.